The acclaimed British viol consort Fretwork will perform works by Jewish composers of the Renaissance and a new commission, "Birds on Fire," by the innovative contemporary composer Orlando Gough, in a concert at Slosberg Music Center at 8 p.m. Saturday, Nov. 13. Fretwork has been called "the finest viol consort on the planet" by the London Evening Standard. This will be the only Boston-area stop on their 2010 American tour. Tickets are $20, $10 for the Brandeis community and $5 for students. Advance purchasers of $20 and $10 tickets receive a $5 discount. Tickets may be purchased at the box office in Shapiro Campus Center or online. The concert is part of a three-day residency that also includes a free, open-to-the-public lecture and demonstration at 3 p.m. Friday, Nov. 12, in Slosberg, titled "The World Encompassed," in which members of the group will talk about Sir Francis Drake's circumnavigation of the world and its musical significance, illustrating their talk with musical selections from their touring concert "The World Encompassed." On Sunday, Nov. 14, from 9 a.m. to 3:30 p.m., Fretwork will give a workshop for players of the viola da gamba on the work of Elizabethan composer Robert Parsons. So far 46 students from the Boston area and around New England have signed up to play in consorts of four to seven viols during the workshop, so the Slosberg classrooms and concert hall will be filled with Elizabethan music, and viols will be for sale in the lobby. Not to be confused with the viola, the viol has six strings, frets and a flat back; it is held on the leg. It has the same ancestry as the guitar, but is played with a bow. The viola belongs to the violin family and has four strings, no frets and a curved back; it is held on the arm. Viols historically were instruments of the educated elites, while violas were instruments of the professional class that they employed. 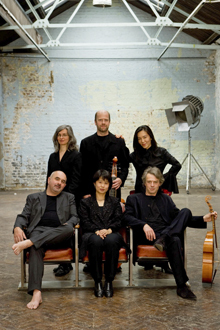 Fretwork's repertoire for their Saturday night concert draws from the Jewish composers expelled from Spain in 1492, who flourished in new court and theatrical venues and created vigorous English dances, Dutch fantasies and Baroque Italian flourishes. Gough's "Birds on Fire" draws on Klezmer and Viennese themes to evoke the interplay of Jews and gentiles in Austria at a time of impending tragedy. Few other ensembles can match the range of Fretwork’s repertory, spanning as it does the first printed music of 1501 in Venice, to music commissioned by the group this year. Their recordings of arrangements of J. S. Bach have won particular praise, but they have recently issued a disc containing music by Grieg, Debussy, Shostakovitch, Warlock and Britten. This extraordinary breadth of music has taken them all over the world in the 25 years since their debut, and their recordings of the classic English viol repertory — Purcell, Gibbons, Lawes and Byrd — have become the benchmark by which others are judged. Their 2009 recording of the Purcell Fantazias won the Gramophone Award for Baroque Chamber Music. "Early music brings another level to the concept of global awareness that's so central to the Brandeis mission," says Sarah Mead, who is associate professor of the practice of music and director of Brandeis' Early Music Ensemble. "Opening our ears to the aesthetics of another time increases the understanding of our shared humanity." Mead, a viol player herself, is the faculty host of the residency, which is made possible by support from the Brandeis Arts Council, the Department of Music and the Viola da Gamba Society-New England.